Berjaya Times Square Theme Park (formerly Cosmo's World) is an indoor theme park on the 5th to 8th floors of Berjaya Times Square, Kuala Lumpur, Malaysia. It was conceived as the "largest indoor, all weather, all ages, entertainment destination in the region" and is the second largest indoor theme park in Asia. 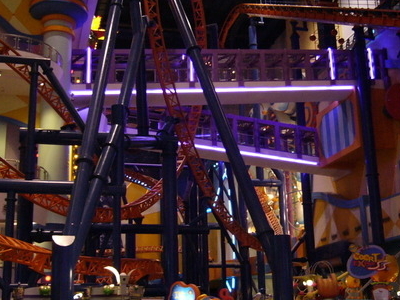 With 14 rides Berjaya Times Square Theme Park is divided into 2 differently themed areas, the Galaxy Station and the Fantasy Garden. Galaxy Station is on the 5th floor and offers rides for adults and children over 13 years of age.